SoCoMo Technologies Pvt Ltd, which runs on-demand delivery services startup and auto-rickshaw aggregator Jugnoo, has raised more money at its existing valuation after pushing back a planned Series C funding round. The Chandigarh-based startup said on Monday it has raised an additional $10 million (Rs 66.5 crore) in an extended Series B round of investment, much of it from existing investors led by the parent of Paytm. This comes three months after the firm's co-founder and CEO Samar Singla told VCCircle that the company was in talks for a $30 million Series C round which it expected to close by the end of January. Startups typically see their valuation rise with progressive funding rounds. Jugnoo raising funds under a stretched Series B round means it didn't get the higher valuation it sought from investors. The startup had raised $3 million in November in the first tranche of its Series B funding round led by existing investor Paytm and then added $2.5 million to close the round in January for a total of $5.5 million. This comes as yet another instance of tech ventures hitting a valuation wall. Indeed, some companies such as digital photography startup Canvera saw a 'down round' late last year and Flipkart, the poster boy of Indian internet business, has seen two of its public market investors—funds of Morgan Stanley and T Rowe Price--mark down the value of their investments. A down round is when a startup raises funding at a lower valuation than what it commanded in the previous funding round. A spokesperson for Jugnoo didn't respond to email queries till the time of writing this article. Earlier in the day, Jugnoo said it raised an additional $10 million in its Series B round from investors led by One97 Communications Ltd, which runs Paytm and put in $5 million. Existing investor Snow Leopard Technology Ventures and new investor Rocketship.vc were among those who put money. Rocketship.vc is an early-stage venture capital firm led by the founders of Kosmix, a social media startup that was acquired by WalMart Stores Inc in 2011. "We will invest these funds in improving our driver efficiency and increasing our numbers in cities where we are currently in the growing phase," Jugnoo CEO Singla said in a statement. The startup had raised $5 million (Rs 32 crore) in May 2015 in Series A funding from Snow Leopard Technology Ventures, Paytm and other investors. Before that, it raised $1 million from Rakesh Mathur, co-founder of Junglee that was acquired and relaunched by Amazon; Vikas Taneja, partner and managing director of BCG Group; Kirloskar Brothers and others in a seed round in early 2015. The firm was co-founded by IIT Delhi alumni Samar Singla and Chinmay Aggarwal in November 2014. It focuses on four segments—auto booking services, taxi aggregation, online ordering and home delivery of meals and groceries. The taxi aggregation segment was added in July when Jugnoo acquired BookMyCab in a cash-and-stock deal. 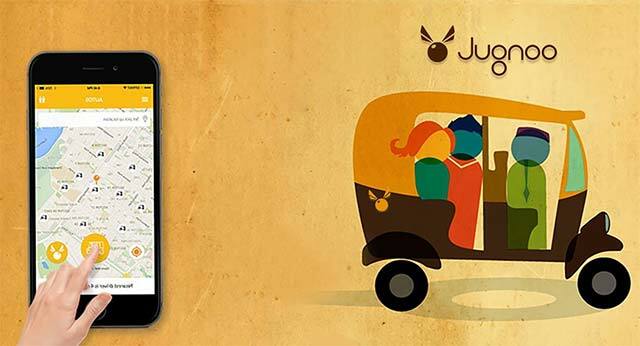 Jugnoo, along with BookMyCab, competes with the likes of Ola, Uber, Meru and mGaadi (only auto-rickshaws) among others. While Ola also offers auto-rickshaw booking service, Uber has suspended this service. Last month, Jugnoo threatened to take legal action against Ola and accused the cab-hailing firm of trying to hurt its business. Jugnoo had recently acquired restaurant discovery app Bistro Offers and mobile-only services marketplace yelo.red. In the grocery delivery space, Jugnoo competes with Grofers, PepperTap and BigBasket, among others. auto-rickshaw aggregator cab aggregator Jugnoo Ola on-demand delivery One97 Communications Ltd. PayTM Rocketship.vc Samar Singla Snow Leopard Technology Ventures SoCoMo Technologies Pvt. Ltd.